Because I like good picture books about art, I’m going to share two today that have caught my eye lately. 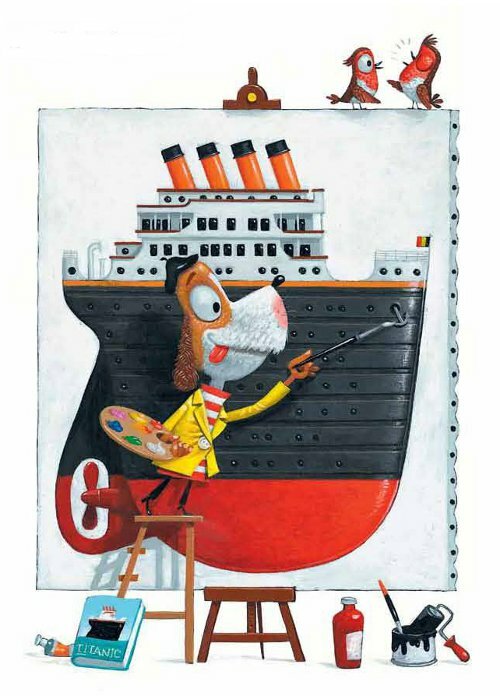 First up is The Magical Life of Mr. Renny, a picture book import from Belgian author/illustrator, Leo Timmers. Originally published in 2010 as Meneer René, we will see the first American edition, thanks to Gecko Press and translator Bill Nagelkerke, this September. “This is not an apple,” this tribute to René Magritte opens with a simple painting of an apple. 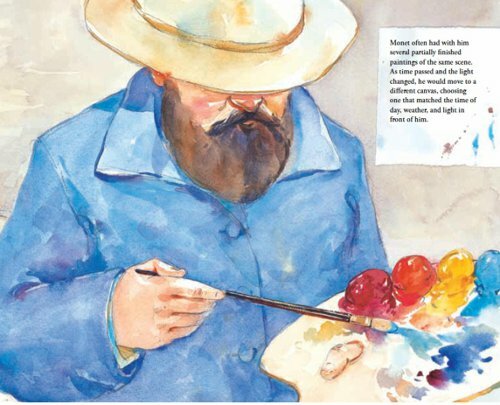 “It’s a painting of an apple,” we read on the next page, while simultaneously being introduced to Mr. Renny, a beret-wearing, paintbrush-wielding dog. After wishing one day that the subject of his painting were real (to satisfy his hunger), a stranger appears, snapping his fingers and making it so that all Mr. Renny’s paintings, henceforth, will spring to life. And I won’t give away the entire plot, except to say that this gets weary to him, resulting in a sort of less-is-more vibe to the entire tale. 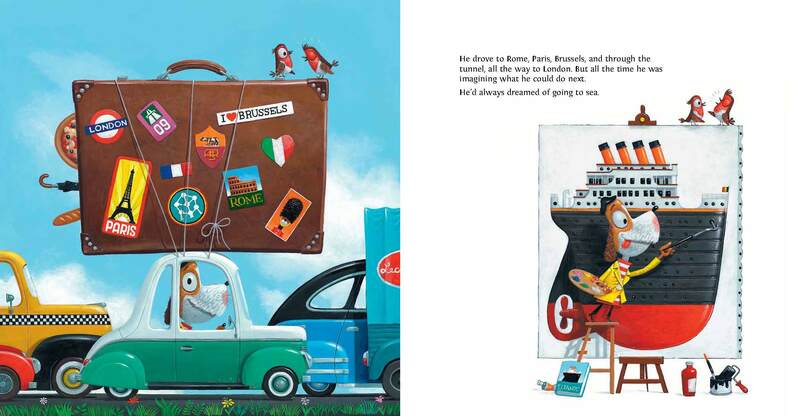 Or, as the Publishers Weekly review wrote, “Is Mr. Renny a real artist? Or has he become someone who only looks like an artist?” Ah, that is the question. “The translation is solid,” that PW review adds, “the pacing is brisk, but it’s Timmers’s arch spreads that take the cake.” Indeed. 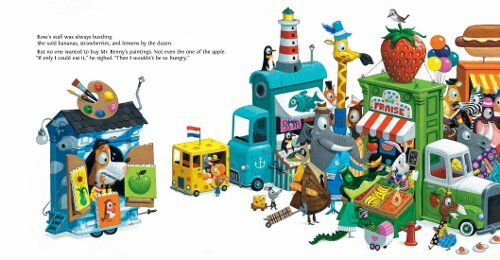 There are lots of picture books that address the notion of being careful what you wish for, but Timmers vibrantly-colored, larger-than-life spreads make this one stand out, particularly if you’re interested, as I am, in seeing what illustrators over the pond, so to speak, are doing. 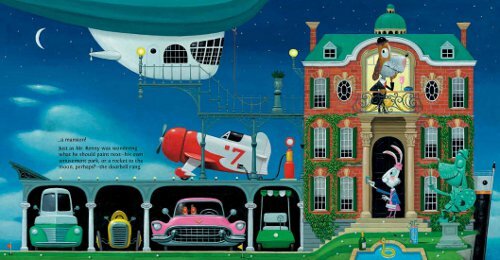 His artwork bursts with energy and color and is altogether not unlike a slightly more amped-up, surreal version of Chris Van Dusen’s artwork. 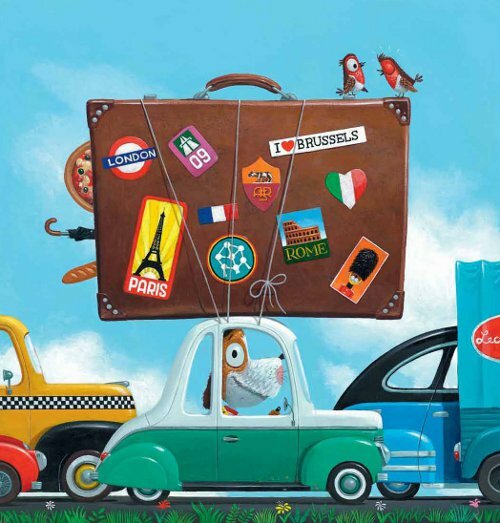 “He drove to Rome, Paris, Brussels, and through the tunnel, all the way to London. 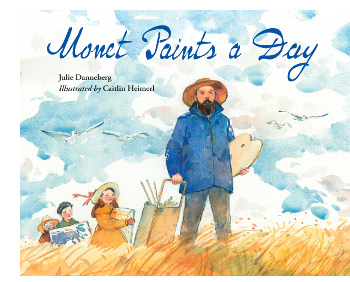 Julie Danneberg’s Monet Paints a Day, released in early July by Charlesbridge, is illustrated in watercolor by debut picture book illustrator Caitlin Heimerl, who studied at RISD. 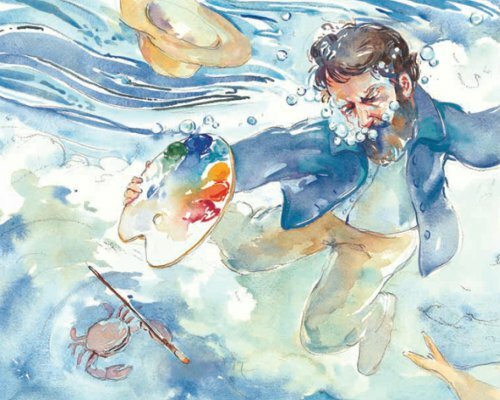 Both author and illustrator capture the determination and stubborn spirit of Monet on one single afternoon near the tide, where he paints what he sees before him. Engrossed in his work while on holiday in Étretat, France, he and his easel, paints, and canvas are swept away by a giant wave. He recovers, trudges away to “dry clothes, a warm fire, and a soothing cup of tea,” ready to start again another day. In an Author’s Note, Danneberg (who is a middle school teacher, which means she is made of superhero—rather, superheroine—material) explains why she doesn’t provide “all the details of Monet’s life and art in this story.” Wanting to give readers a sense of his single-minded nature and focus, she lays the story out in the same way he and other Impressionists created their work — by capturing the feeling or impression of his day. This book, which hardly sentimentalizes or romanticizes the painter’s work, closes with a note on Monet’s painting techniques, as well as a bibliography. 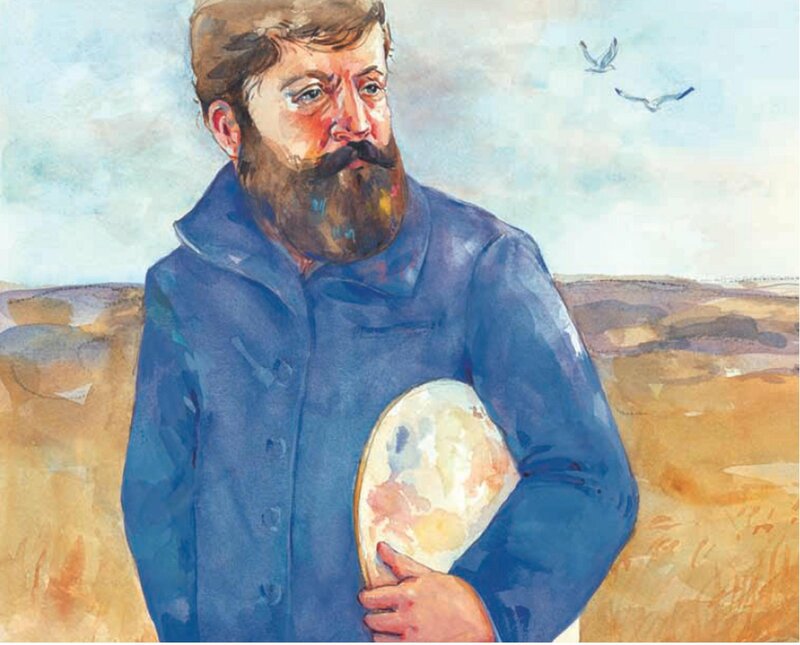 Nearly every spread includes a boxed fact about Monet, his work, his technique, and how he wrote to his fiancée, Alice Hoschedé, about progress on his paintings. In fact, the book is framed by an 1885 letter to her about his attempt to paint at the shore. This is an engaging, honest, and (in many ways) stark portrayal that humanizes an iconic painter, and it’s a promising debut from Heimerl. Here are some illustrations. Enjoy. “The wind splatters sand against my neck and into my paints, but I don’t mind. “The wave drags me into the sea, which swallows me whole. I tumble like a shell against the bottom of the ocean. My lungs empty, and my heart pounds with fear. THE MAGICAL LIFE OF MR. RENNY. English language edition copyright © 2012 by Gecko Press. Illustrations reproduced with permission of the publisher. MONET PAINTS A DAY. Copyright © 2012 by Julie Danneberg. Illustrations copyright © 2012 by Caitlin Heimerl. Illustrations reproduced with permission of the publisher. 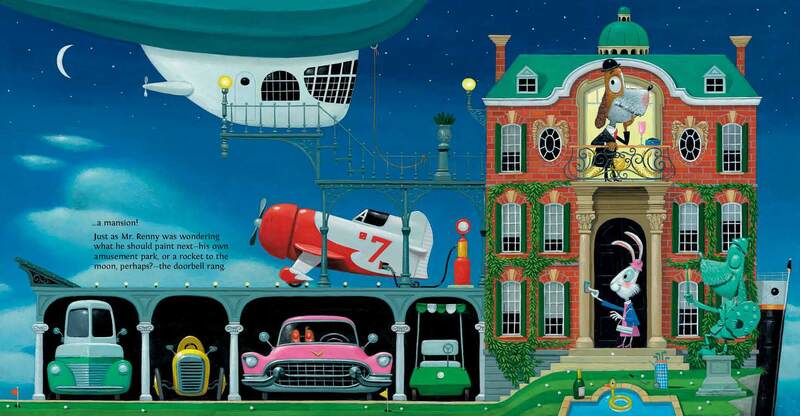 Illustrations in Mr. Renny are just incredible! Must check the author’s site immediately. 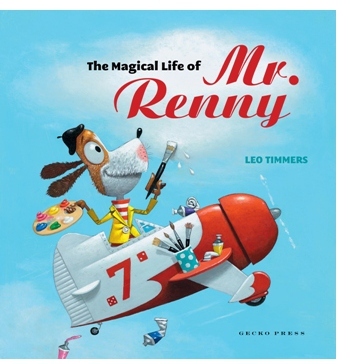 I am looking forward to seeing The Magical Life of Mr. Renny! Have you seen the new book about Magritte published by Houghton Mifflin: Magritte’s Marvelous Hat by DB Johnson? It is pretty wonderful too. And there is a new book coming about Matisse very soon: Colorful Dreamer. 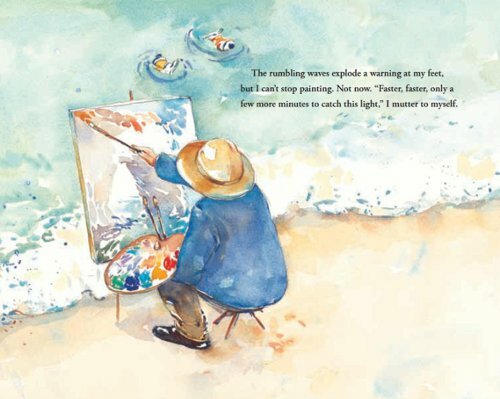 Ed, yep, mentioned it at Kirkus back in January and followed up with art here at 7-Imp: http://blaine.org/sevenimpossiblethings/?p=2277. I love D.B. Johnson’s work. Consistently. And I totally meant to mention in this post that this import would be good to pair with D.B.’s book. Thanks for the Matisse link, too. Will this be a children’s book? 9780803737587 It is a Penguin book (Dial). It is due out in November. By Marjorie Blain Parker and illustrated by Holly Berry. We will see. Magritte is, hands (and bowler hats) down, my favorite Surrealist. Looking forward to Mr. Renny! Philip, I completely agree, I was always sad that my art history professors always seemed to give so little time to Magritte mentioning only his “Ceci n’est pas un pipe”; I loved showing more of his work to my students last year!